More information, more options, and more control over their personal choices as consumers. Most Americans believe that the rise of the Internet and the spread of social media has delivered all of those tangible benefits, according to a new Allstate/National Journal Heartland Monitor Poll exploring public attitudes toward the cascading technological advances that have revolutionized communication between individuals, business, and government. Millions of Americans, the poll found, use online tools not only to comparison shop but also to learn from the collective experience of other consumers and to contribute to that mass judgment by posting accounts of their experiences, good or bad, with businesses and government. A solid majority of Americans, especially those who actively use social media, believe that this ongoing communications revolution is enhancing their ability to make informed choices as consumers. A narrower plurality of respondents also feel that the same dynamics are equipping them to make better choices as voters. But for ordinary Americans, has this explosion of Internet use increased their influence over the public and private institutions that shape their lives? On that front, despite high-profile examples of online uprisings that forced changes on such companies as Bank of America and Netflix, Americans are much more dubious. In the survey, only small minorities say that big companies or government are more responsive to public complaints than they were 10 or 15 years ago. And comparably small percentages believe that their influence over those institutions has increased during this period. Moreover, the poll found, most people believe that big institutions engage online mostly to advance their own agendas rather than to genuinely seek feedback from consumers and citizens. Most people also still express more trust in traditional information sources, such as newspapers and television news, than in online forums. Skepticism about the motivation and trustworthiness of both government and big business remains endemic as well. "For every company that's willing to listen to the criticism, there's far more [of them] willing to stifle dissent," said Beth Thibault, the technology manager for a consulting firm in Westport, Conn., who responded to the poll. But ubiquity has not yielded credibility for social media, the survey found. Social media and blogs ranked at the bottom when the poll asked respondents how much they trusted information they received from different individuals, groups, and media platforms. On this broad measure, just 30 percent of those polled placed a "great deal" or "some" trust in information when they "hear it, see it, or read about it" on social-media websites and services such as Facebook, Twitter, and others. Nearly twice as many (58 percent) say they put not very much or no trust in that information. Blogs didn't score much better: Just 34 percent expressed much trust in them, compared with 53 percent who said they had little trust. In each case, the finding was comparable to the modest 37 percent who placed a great deal of trust in advertisements. For both sources, regular social-media users expressed only slightly more trust than the public overall. More-traditional information sources performed better. Public television and radio (including NPR and PBS) ranked highest, with 75 percent expressing a great deal of faith in them. Following were newspapers (71 percent); cable news programs (70 percent); network news (64 percent); magazines (57 percent); talk-radio programs (53 percent); and company websites (51 percent). The survey found that online sources scored better in a question tied to purchasing decisions. The poll asked respondents how much consideration they gave to an array of information sources when buying a product or service. 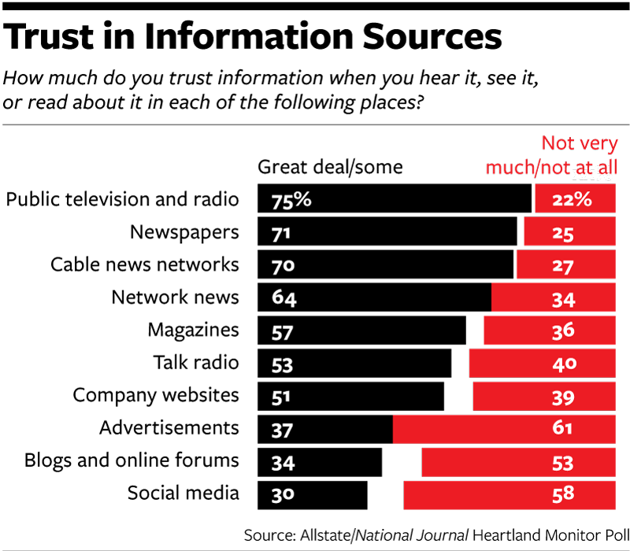 Continuing another consistent Heartland Monitor finding, by far the most trusted sources were those closest to home: Nearly nine in 10 said they relied a great deal or some on conversations with friends, family, and acquaintances. Nearly three in four leaned heavily on "expert reviews in publications like Consumer Reports and major newspapers," and 57 percent cited advertising. But online forums (59 percent) and online reviews from other consumers on sites such as Yelp and TripAdvisor (54 percent) also scored well. Among regular social-media users, reliance on those sources soared to 72 percent and 66 percent, respectively, approaching the level of users who consult expert publications (77 percent). About seven in 10 young adults also report relying heavily on those sources. What's more, it's becoming much more common for Americans to not only seek information about their experiences but also share it: More than half of regular social-media users say they have posted a review or comment online after a positive experience with a product or service, and nearly half say they have done so after a negative experience. "It's impossible to call companies; they want to put you on a live Web chat all the time. " — Beth Thibault, Westport, Conn. Such assessments help explain why a resounding 60 percent of respondents agreed with the statement that "the rapid growth of the Internet, most recently through social media," has made it easier "to be a well-informed consumer. " Only 32 percent said that the information explosion "has made it harder for me to be a well-informed consumer" because of unreliable reports or by overwhelming people with "too much information to manage. " The share who believe that the Internet has empowered them rises to 68 percent among college graduates, 69 percent among social-media users, and 73 percent among those who use the Internet several times daily. But it's not just the young digerati who feel that way. Robert Merkle, a retired 73-year-old former owner of a gourmet-food shop living in Bayville, N.J., succinctly expressed the consensus in the poll across a broad range of groups. "I don't buy anything or go anywhere without checking online," he declared. For many of those who consult consumer reviews online, the one major hesitation is the fear that companies selling the product have planted the positive responses. "I tend to look at Amazon reviews and a few blogs," said Justin Merritt, a music professor in Northfield, Minn. "I always have in the back of my mind that a lot of reviews are planted, so I'm always a little bit skeptical. " That concern, which surfaced surprisingly often in interviews, reflects a broader suspicion in the survey about the motivations of businesses that are active on Facebook, Twitter, or other sites. Among those who regularly use social media, just one in five said that companies use such sites primarily "to collect feedback "¦ so they can improve their businesses and personally respond to questions. " Nearly three in four said that corporations instead use these tools to "more easily advertise their products and services and collect information about current and potential customers so they can increase their profits. " Social media users were even more skeptical than those respondents who don't heavily frequent such sites. Social-media users assessed corporations more charitably on another set of questions. Nearly three-fifths tend to view companies that are active on social media as more "accessible and responsive to the questions and concerns of people" like them. Just under half said a company's visibility made it more likely that they would view that firm as open in its business practices or dependable in its actions. But only 42 percent said that this social-media visibility influences them to see businesses as more trustworthy. It might be cold comfort in the corner office, but in a separate question, government scored considerably worse than the private sector on reliability (with only 39 percent rating it consistent and reliable in its actions) and no better on the other three measures. When respondents were asked which institutions they trust as information sources, the federal government (at 51 percent) and major corporations (42 percent) scraped the bottom of a list topped by small and local businesses (nearly nine in 10) and local and state government (around two-thirds). Political candidates faced even more skepticism than corporations from social-media users about their reasons for using such sites: Just one in six saw a genuine effort by candidates to "more easily interact with voters and collect feedback," while almost three in four thought they participated to "more easily advertise their campaigns and positions and "¦ increase their chances of winning" campaigns. When asked if the emergence of the Internet and social media has made it easier to be a well-informed citizen, both the public overall and social-media users divided more closely than they did on the comparable question about consumerism. Only 47 percent of all adults said that the information explosion had better equipped them as a citizen by making it easier to research candidates and issues; 41 percent said that it had made it harder "because there is now too much information to manage, and it is hard to know what information is reliable and trustworthy. " For social-media users, the division was 55 percent positive and 40 percent negative — higher than the public overall, but still well below the balance among the digitally active on the question about consuming. Still, those polled didn't see a systematic trend toward greater responsiveness. Asked to assess how corporations deal with complaints, 28 percent said they considered companies more responsive than 10 or 15 years ago, 25 percent said less responsive, and 42 percent saw no change. Social-media users were somewhat more optimistic: 34 percent perceived greater responsiveness, compared with only 21 percent who perceived less; 41 percent saw no change. The verdict is even gloomier about the impact of these new tools on government. Just 18 percent of adults feel that government agencies are more responsive than 10 or 15 years ago, compared with 30 percent who see them as less responsive, and 44 percent who see no change. Only 14 percent believe their influence over government decisions has increased over that period; 35 percent see less influence, and 45 percent perceive no change. In each case, the numbers are equally pessimistic for social-media users. Less than two-fifths say that government is responsive to complaints about negative experiences. Thomas Koch, a construction manager in Baltimore, expressed a common source of skepticism about the prospect of easier communication yielding more public influence over political decisions: "Politics is driven by money," he said. Still, in a summary question asking Americans to balance all of the effects of the communications revolution on the marketplace and politics, a 49 percent to 39 percent plurality said it had provided individuals more influence by allowing people "to quickly communicate and organize around common objectives. " Regular social-media users were slightly more encouraged than the population overall, as were respondents under 40. Americans may not yet see evidence that the virtual community made possible through the Internet is forcing big institutions to genuinely respond more to their needs. But at a moment when so many Americans feel that the struggling economy has left them paddling alone, the opportunity to learn from, and sometimes join with, others online is becoming an important source of support. Taken together, these contrasting attitudes extend a central — perhaps the central — thread in the 13 Heartland Monitor surveys conducted since early 2009. In the latest survey, most Americans say that the emergence of constant communication is providing them with better tools to make decisions under their immediate control, such as buying a car or planning a trip. But most doubt that these tools are increasing their leverage over the vast public and private institutions that shape the larger currents of American life. That dynamic is similar to the attitudes expressed in earlier surveys about issues from retirement security to lifetime employment: In an economy that now offers individuals both more choices and more risks, most Americans have become reluctant individualists, trusting their own efforts, rather than any institution, to obtain security. The Allstate/National Journal Heartland Monitor polls explore the ways that Americans are navigating the changing economy. The latest poll, conducted by Ed Reilly and Jeremy Ruch of FTI Strategic Communications, a communications-strategy consulting firm, surveyed 1,000 adults by landline telephone and cell phone from May 19-23. It has a margin of error of plus or minus 3.1 percentage points. This survey focused on Americans' experiences with online communications, particularly social-media tools such as Facebook, Google+, Twitter, and LinkedIn. The poll explored how individuals are using these tools to interact with businesses and government, and whether their development is changing the sources of information that people use in making consumer and political choices. Fundamentally, the poll documented the remarkable spread of the Internet and social media through American life. Slightly more than four-fifths of adults use the Internet at least occasionally, and that figure predictably rises to near-universal adoption among younger people (96 percent of those ages 18-29, and 94 percent of those 30-39); those with at least a four-year college degree (90 percent); and those earning at least $100,000 annually (93 percent). Most Internet users report using it at least several times a day. "I don't buy anything or go anywhere without checking online. " — Robert Merkle, Bayville, N.J.
Nearly four-fifths of Internet users say they have an active social-media account and that they've accessed it in the past month. That percentage soars to more than 90 percent among Internet users ages 18-29. (Interestingly, nonwhite Internet users are somewhat more likely than whites to use social media.) In all, just under two-thirds of adults say they regularly use social media. Among that group, Facebook is by far the most popular site: 79 percent of regular social-media users have an active account there. Google+ was next at 43 percent, followed by Twitter at 20 percent, and LinkedIn at 19 percent. No other site cracked double digits.